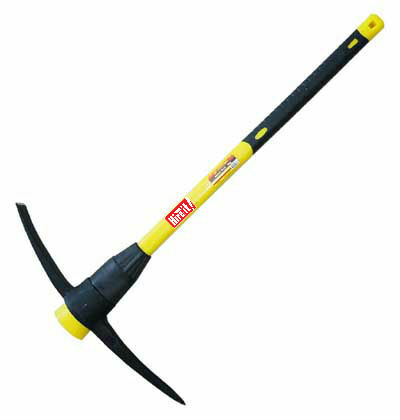 • A pickaxe or pick is a hand tool with a hard head attached perpendicular to the handle. • The head is usually made of metal, and the handle is most commonly wood, metal or fiberglass. The head is a spike ending in a sharp point, may curve slightly, and often has a counter-weight to improve ease of use. The stronger the spike, the more effectively the tool can pierce the surface. Rocking the embedded spike about and removing it can then break up the surface.